Abraham was a nomad. Boaz was a farmer. David was a shepherd (and a king). Joseph was a craftsman. Jesus was a teacher (and the King). Peter was a fisherman. 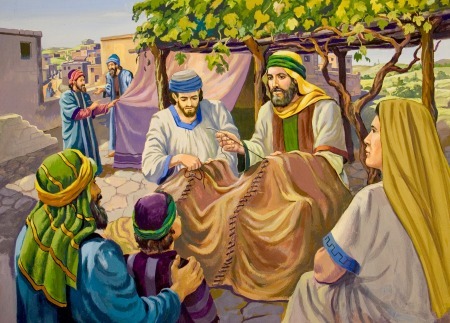 Paul was a tent maker. professions (or are training for one someday). The book of Proverbs is full of wise sayings about the reward of working hard. "Hard work brings a profit, but mere talk leads only to poverty" (Proverbs 14:23). "He who works his land will have abundant food, but he who chases fantasies lacks judgment" (Proverbs 12:11). While work is important and has purpose for promoting self-worth as well as providing for one's needs, it should not become our main focus. I have been struggling with this for years, ever since I began my first full-time job. I have not found contentment in my job. Honestly, I never will. This is because work is a curse as a result of rebellion against God. "The ground is cursed because of you. You will eat from it by means of painful labor all the days of your life. It will produce thorns and thistles for you, and you will eat the plants of the field. You will eat bread by the sweat of your brow until you return to the ground, since you were taken from it. For you are dust and you will return to dust" (Genesis 3:17-19). "I hated all my work at which I labored under the sun because I must leave it to the man who comes after me. And who knows whether he will be a wise man or a fool? Yet he will take over all my work that I labored at skillfully under the sun. This too is futile. So I began to give myself over to despair concerning all my work I had labored at under the sun. For there is a man whose work was done with wisdom, knowledge, and skill, but he must give his portion to a man who has not worked for it. This too is futile and a great wrong. For what does a man get with all his work and all his efforts that he labors under the sun? For all his days are filled with grief, and his occupation is sorrowful; even at night, his mind does not rest. This too is futile" (Ecclesiastes 2:18-23). Wow. What a sad existence we truly have if our efforts and focus lie solely in our work and profession alone. Yet, beautifully the Holy Spirit of the only eternal God gives us a refreshing new view on labor and toil. "But seek first the kingdom of God and His righteousness, and all these things (food, clothing, shelter, etc.) will be provided for you" (Matthew 6:33). Wow again. The Lord Jesus says to trust God, seek His kingdom first, and THEN all the things you need will be provided for you. How often I get it "twisted". Some days, I wish I could have walked with Paul or Peter on their missionary journeys and seen how they balanced toilsome labor with preaching the Gospel. Sometimes I wish I could be in King David's courts, learning from his son Solomon. Other days I wish I could physically walk with Jesus as one of His disciples. Yet I have not been left alone without mentor or guide. God's Word still remains true and constant regardless of the changing days, months, and years. In addition, Jesus has given us His Holy Spirit to guide and direct us even through our work. "There is nothing better for man than to eat, drink, and to enjoy his work. I have seen that even this is from God's hand. For who can eat and who can enjoy his life apart from Him? For to the man who is pleasing in His sight, He gives wisdom, knowledge, and joy, but to the sinner He gives the task of gathering and accumulating in order to give to the one who is pleasing in God's sight. This too is futile and a pursuit of the wind" (Ecclesiastes 2:24-26). As difficult as it is to maintain a clear perspective in the busy-ness of the work day, my profession must be that I am in Christ always. To be a Christian - an alien - in a world so focused on meaningless work is to be a minority to say the least. Let us keep our heads up, focused on the Eternal Kingdom of God, even as we toil and sweat below the sun, knowing in our hearts and minds that our jobs are a means for the Lord's love to overflow out of us into the people with which we work. Let our profession be Jesus! "In any profession it gets to be a grind" (Denzel Washington). I do not believe in the rapture.